To celebrate International Family Day, which is observed on the 15th of May every year, the Gasol brothers star in a series of animated and educational videos in which the whole family can enjoy, while also learning about the importance of physical activity and sports, healthy eating, duration and quality of sleep, and emotional well-being, the 4 fundamental pillars Gasol Foundation promotes daily in order to encourage healthy habits and achieve its Zero Childhood Obesity global initiative. Childhood obesity affects 42 million children worldwide. The first steps to achieving this Zero Childhood Obesity challenge starts with the family. Having a family unit that is involved and supportive is crucial. Pau and Marc support each other both on and off the court everyday. They even encourage and motivate each other in regards to practicing the 4 healthy pillars, and also work with one another to help implement such health practice and behaviors. Even from a very young age, they have been interested in children’s health. Their mother and father, a doctor and nurse, respectively, always instilled in them the importance of adopting a healthy lifestyle. The Gasol family as a whole represent an example of a family unit that worked together to obtain healthy overall lifestyles. Each member held each other accountable, and by doing so, were able to have a huge impact in each other’s health journeys. Both brothers applied and continue to apply all of this knowledge into adulthood, thus founding Gasol Foundation in 2013. Throughout the years, Gasol Foundation has had numerous programs, initiatives, etc. for children that advocate the significance of healthy habits. Its latest endeavor is the launching of “The Healthy Galaxy”, a fun and kid-friendly web series that consists of 6 mini episodes that highlight the 4 pillars of healthy habits for children and their families: physical activity and sports, healthy eating, duration and quality of sleep, and emotional well-being. Much emphasis will be place on the last two pillars, as they are just as important as the others, but are often disregarded and not practiced enough. The objective of this Gasol Foundation initiative is to promote healthy habits and reduce the figures of childhood obesity rates by utilizing a methodology that places prevention at the core of the strategy. Gasol Foundation realizes that positively transforming the environments of minors is the only effective way to change unhealthy behaviors. Although, the web series are suitable for all audiences, they were especially created so that the little ones can have fun while learning about the 4 pillars, or “planets”, in “The Healthy Galaxy”. This fun and practical approach will provide examples on how to include health habits in the daily lives of families in order to help improve healthy routines in the home. Additionally, to enhance the educational nature of the web series, the episodes are both in Spanish and English, includes subtitles, and contains easy to follow dialogue for children of all ages. The first episode is already available on the Gasol Foundation YouTube channel. 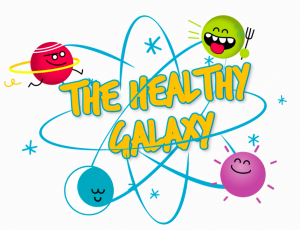 This premier episode introduces the 4 planets in “The Healthy Galaxy”. During the next five episodes, children will get the opportunity to explore this galaxy in its entirety. The whole family can also have a good laugh while enjoying the “Healthy Bloopers” feature in which Pau and Marc show off their sense of humor with jokes, funny faces and so much more! You don’t want to miss out! You can watch a brand new episode each week. And by June 13th, all episodes will be available. Enjoy!